FILE - Senate Majority Leader Mitch McConnell of Kentucky speaks during a news conference in Washington, Dec. 12, 2016. The top Republican in the Senate outlined a series of actions he hopes President-elect Donald Trump will take to overturn environmental regulations imposed by President Barack Obama, including a rule to protect streams from coal-mining debris. Majority Leader Mitch McConnell of Kentucky urged Trump in a letter to scrap a rule to protect small streams and wetlands from development and other regulations that the GOP considers overly burdensome. He also asked Trump to drop a legal defense of the Clean Power Plan, Obama's signature effort to limit carbon pollution from coal-fired power plants. The plan, the linchpin of Obama's strategy to fight climate change, is on hold awaiting a court ruling. In a January 4 letter to the president-elect, McConnell said Trump "inspired the American people with your vision of less regulation, free and fair competition, and enhanced job opportunities." McConnell said he personally appreciated Trump's public commitment to "provide relief for coal communities" such as Kentucky, the state that is the third-largest producer of coal in the U.S.
McConnell's letter decried what he and other Republicans describe as Obama's "war on coal," a series of regulations that the GOP says has made coal more expensive to mine, transport and use for energy production. U.S. coal production has declined sharply in recent years amid stiff competition from cheap, easy-to-produce natural gas. But McConnell said those who attribute coal's decline simply to low gas prices "are not seeing the full picture," which he said includes costly federal regulations that place an unfair burden on coal. 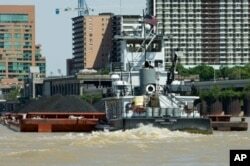 FILE - A tugboat pushes a barge loaded with coal up the Ohio River, past downtown Louisville, Kentucky. McConnell called the stream-protection rule "a direct assault on coal-mining operations" that "must be stopped." He pledged to use the rarely invoked Congressional Review Act to overturn the stream rule and asked for Trump's support in that effort. The review act requires a simple majority of both chambers and the president's signature to make a recently enacted regulation invalid. The Congressional Research Service estimates that rules submitted on or after June 13 are subject to disapproval by Congress. The stream rule was finalized in December. Separately, McConnell urged Trump to drop legal defense of the Clean Power Plan and the clean-water rule, calling each "an abuse of power" and harmful to coal communities. McConnell also urged Trump to scrap a separate rule targeting future power plants and to boost technology that captures and stores carbon dioxide, a key contributor to global warming. Carbon-capture technology is considered crucial to development of so-called clean coal, a concept that Trump has supported in the past. The technology is expensive and unproven, but it has long been a goal of coal producers and their supporters in Congress. McConnell asked Trump to work with lawmakers to ensure long-term health benefits for retired coal miners, including at least 16,500 who face a loss of benefits at the end of April. Democrats, including Senator Joe Manchin of West Virginia, have made retention of coal benefits a top priority and criticized a four-month extension McConnell and other GOP leaders pushed for in December. Democrats want to extend health benefits for at least a year and are seeking to ensure hundreds of millions of dollars in pension benefits they say are at risk because of a host of coal-company bankruptcies. McConnell's letter to Trump does not address pension benefits.